Our Ardis Wannabe (artist want-to-be) item pulled from the bag at last Guild Meeting was a little brass bell. For those who choose to participate, we can create anything, using that item as inspiration to make something - no rules except it has to be DONE, and we suggest Keep It Simple. mmmm, well, there is the old farm dinnerbell on my back porch, and that's as far as my pea brain would go, and THAT was no-where. But, I've wanted to try Tonya's LazyGal Free Form letters for a long time, and this is what came out of it tonight during a sewing frenzy - strips everywhere, threads, cut-offs etc. (I did not include a photo of the floor!) LOL I only thought of using 2 highly contrasting fabrics. Thanks Tonya for the idea! 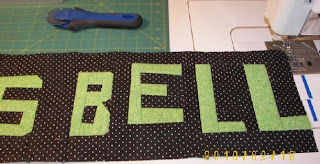 Words look so cool in a quilt border and this was my trial run. This took me about 2 hours with some short breaks to stretch. Wonky was what I wanted! I won't be hesitant to try them again on a REAL quilt. Maybe it's time to open up that drawer and see what I can make from it. Love them - have wanted to try doing words too but haven't done it yet. Good job. This looks like fun. Check out the link on my blog to Wayne's blog. 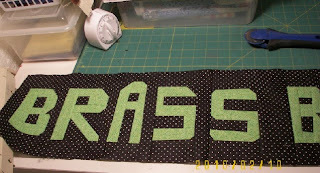 He has some neat ideas about doing letters that are really small (you might have to search for the posts). So many ideas... need more hours!! Love the words. I envy you and Tonya so much for being able to free up and create. Maybe letters will come for me someday. And an aside, one of the founders of my quilt guild is named Ardis. Very cool! Your letters turned out great! Great Wonky letters. (My you got detailed with the S's and B's. I love my two wonky letter quilts.